Benjamin Franklin once said, “There are only two things certain in life: death and taxes.” Now I’m not here to challenge old Ben, but I’ve lived long enough to feel pretty confident about adding one more to his list. That is, “There are only three things certain in life: death, taxes, and the sun will rise tomorrow.” And with that third certainty comes the opportunity to capture a free source of energy to power our homes, businesses, and planet. Although having the ability to consistently and with certainty capture an unlimited free power source sounds like a “no lose” business proposition, the solar industry has always faced stiff head-winds. Their most formidable challenge has always been to lower the cost to convert that free energy into a useable form that is competitive with fossil fueled sources (brown power). Equally challenging is navigating the continuously shifting support for politically imposed subsidies to “level the playing field” between the comparatively higher cost of green solar versus cheaper brown power. So, knowing cost is the pivotal factor, can the solar industry ever achieve price equity with brown power? I believe the answer is a resounding yes! As is typically the case, technology is revolutionizing the solar industry (I’m sure Ben Franklin would appreciate my choice of words here!). Solar voltaic panels are becoming more efficient at lower production costs. A short five years ago, it cost nearly $4/watt to produce solar power. Two years ago, that cost was halved to $2/watt, and today it has halved again to just about $1/watt. 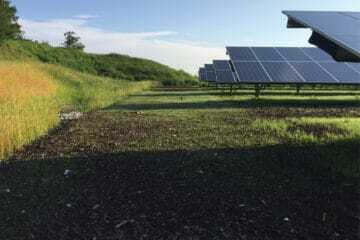 In terms of cost per kilowatt hour, 2 years ago when Nobis started working with solar developers, the price needed to support a solar project was in the 12-15 cents per kilowatt-hour range compared to 6 cents per kilowatt-hour for brown power. Today, solar developers are building projects with a sale price of 8-10 cents per kilowatt-hour. As you can see (and what should be music to everyone’s ears) is solar power is rapidly closing the price gap with its arch rival brown power. The rapidly falling price of solar really “kills two birds with one stone.” As the price gap narrows, consumer’s generally choose the greener source. And with that all important consumer choice, the need for unpredictable subsidies evaporates. Because of advanced technologies, lower equipment costs, and a diminishing reliance on subsidies, the future of solar looks bright (pun intended)! With more than two years of solar project design and having permitted more solar in New Hampshire than any other firm to date, Nobis Engineering is strategically positioned to grow right alongside this burgeoning industry.